Hardware: ACORN MasterKey 49 midi keyboard, or any midi capable keyboard. 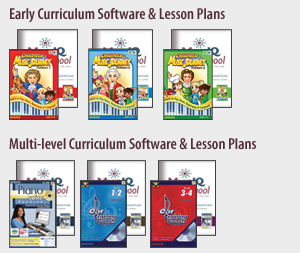 MusIQ HomeSchool’s Early Curriculum incorporates a “teach, practice, apply” methodology that successfully teaches young learners to read music, play piano with both hands, compose and improvise. The program utilizes Children’s Music Journey, a 3-Volume interactive software series designed in partnership with leading music pedagogy experts to address and exceed national music reading and understanding objectives. The program provides an excellent background for continued development with the piano instrument and is an ideal preparation for band programs. In 2006, the American Federation of Teachers selected Children’s Music Journey to represent elementary music programs in the 21st Century Classroom. The program begins by introducing the concept of relative pitch presented in pictorial format, with bird symbols representing high notes and whale symbols representing low notes. Initially, the only specific pitch named is middle C. The musical staff and notation system evolves over Year 1 to reflect the progression from relative pitch patterns to specific pitches. Lessons 1-10 introduce directional note sequences, ascending and descending to and from middle C. The idea of double notes (playing two notes simultaneously with both hands) is also addressed. By the end of the fourth lesson the pictorial notation gives way to un-stemmed note heads and eventually, to regular stemmed notation in Lesson 19. In Lesson 11 finger numbers are learned and over the next few lessons students are versed in middle C position and can play simple, popular songs by finger number. Also presented is the concept of musical steps. In Lesson 19 the simple one-line staff (marking middle C) gains additional lines on either side as students step further from middle C.
In the final ten lessons, students learn the musical alphabet and then relate it directly to the keys on the keyboard in middle C position. By the end of the first Volume students are working with a five line staff with a central, bold line marking middle C.
The concept of rhythm is first introduced in Lesson 3 when students repeat various ‘Word Phrase Rythms’. Students repeat simple, four count patterns of quarter and eighth notes, based initially on word patterns and later by counting numbers (e.g. 1 2& 3 4&). In Lesson 6, students repeat ‘4 Count Rhythms’. Sustaining notes are also introduced . Holding notes appear as a note-head followed by numbers representing the counts. In Lesson 22 students learn the proper notation of half note. In Lesson 23, students learn proper notation of whole notes. In lieu of ordering individual software titles (CD-ROMs), families have the option to subscribe and download the entire program for $10.95 a month. Keyboard and Lesson Plans sold separately. Internet connection required. View subscription details ». Tapping 1 and 2-bar notated rhythms. The middle C line is ‘peeled’ away and lines are added to form the grand staff. Students become familiar with the grand staff and are gradually taught the notation of the notes in middle C position, working outwards. By the end of Year 2 students are learning songs played by both hands simultaneously. Lessons 26-30 review the simple staff style, and allow students to practice finger number songs in middle C position, before going on to standard notation in the grand staff. Lesson 31-45 introduce the Treble Clef, Bass Clef and reading by musical steps in the grand staff, in middle C position. Students also learn the meaning of piano and forte, and learn how dynamic symbols are notated. Lessons 46-60 incorporate reading by musical skips and relate the grand staff back to earlier concepts of directional note sequences. Students understand how all the notes from F below Middle C to G above Middle C are notated on the grand staff. Rhythmic understanding is reinforced through ‘rhythm tapping’, where students perform notated rhythmic patterns, which become more challenging as more concepts are introduced. While the rhythmic assessment tool has been reasonably forgiving, now continuity and consistency of tempo become more important in terms of assessment. Lesson 31 introduces ‘Dotted Half Notes’. Lesson 34 introduces bar lines and time signatures. Lesson 36 introduces ‘Tapping Notated Rhythms’. Lesson 39 introduces ‘Bar Lines and 4/4 Time Signature’. Lesson 50 introduces playing songs in time with metronome and quarter, half and whole note rests. Lesson 54 introduces ‘Eighth notes’. Lesson 56 introduces ‘Rests’. Lesson 57 introduces ‘3/4 Time Signatures’. Lesson 58 introduces ‘Ties’. In lieu of ordering individual software titles (CD-ROMs), families have the option to subscribe and download the entire program for $10.95 a month. Keyboard and Lesson Plans sold separately. Internet connection required. Sharps, flats and naturals are first seen at the start of Year 1. Students move to notation of the standard C position and begin reading and understanding intervals of 2nds through 5ths. Lessons 61-65 review Grand Staff notation and songs in Middle C position, complete with F and P dynamics. Lesson 66-80 introduce Sharps, Flats and Naturals. Students also learn how to play songs with both hands moving together. Then they learn to play with held notes in the left hand and moving notes in the right hand. Lessons 81-95 introduce standard C position and intervals of 2nds, 3rds, 4ths and 5ths. Students learn the difference between intervals played at the same time (harmonic) and intervals played one note after the other (melodic). They also learn about broken and solid three-note chords. Then they learn how to play songs with chords in the left hand and melody in the right hand. The elements of rhythm are expanded to include additional rests and tapping of notated rhythms including ties. Different combinations of more complex rhythms are introduced, progressing to different rhythms at the same time in the right and left hands. Lesson 68 introduces ‘Half Rests’. Lesson 71 introduces ‘Tapping Notated Rhythms with Ties’. Lesson 73 introduces ‘Tapping Notated Rhythms with Rests’. Lesson 75 introduces ‘Tapping Notated Rhythms with Both Hands’. Lesson 80 introduces ‘Tapping Notated Rhythms with Both Hands in 3/4 Time Signature’. Lesson 86 introduces ‘Tapping Notated Rhythms with Held Notes in the LH and Moving Notes in the RH’. Lesson 88 introduces ‘Tapping Notated Rhythms with Held Notes in the LH and Moving Notes in the RH in 3/4 Time Signature’. Lesson 91 introduces ‘Tapping Notated Rhythms Hands Together with Ties’.